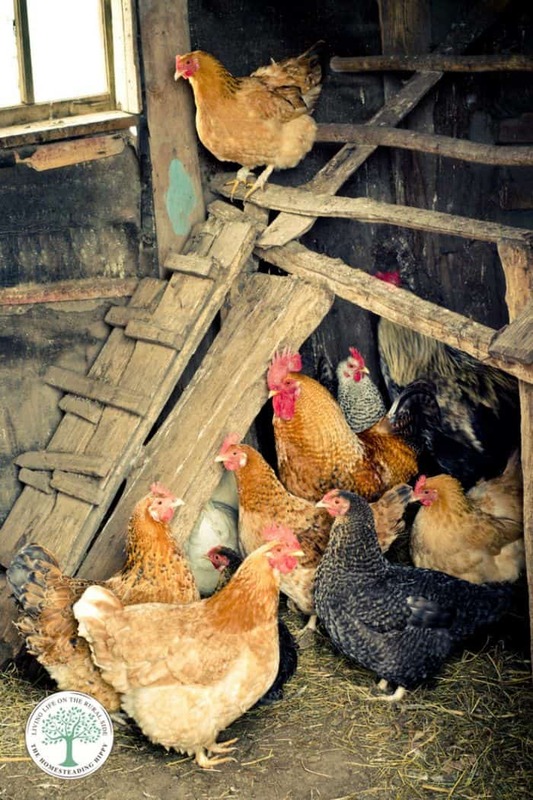 Chicken Coop Bedding-Which Bedding Is Best For YOU? All chicken owners will need to think about chicken coop bedding. Especially if they are in a stationary coop. Adding bedding makes manure removal easier, keeps the coop clean, and can help keep the coop warmer in winter. The type of chicken coop bedding material to use is up to you. If you have a wooden or concrete chicken coop floor, you will want some type of chicken coop floor material. This will help keep manure easier to clean and a healthier flock. If you don’t have a concrete or wood floor, a dirt floor chicken coop isn’t a bad way to go. It just may mean a bit more shoveling to remove manure build up. Sand – Very popular to use and often easy to obtain, sand can be purchased from your local quarry or hardware store. It is a great chicken coop bedding option because it can also act as grit for the chickens. It is as easy to clean as a litter box and it is cheap. Sand also does not need to be completely removed from the coop. You can just add more as you need. It also prevents dust from being stirred up in the coop. If your coop houses 30 or more chickens, expect more work to maintain a clean space. Deep litter method with straw. – Even more budget friendly than sand, straw may be a better chicken coop bedding option. However, this will depend on the size of your coop. It is easy to lay down, less heavy than bags of sand, and can be moved into garden beds or the compost pile when it is changed out. The chickens will love scratching through the straw and will even help you spread it around. Simply drop a couple bales of straw, remove the strings, and let the girls do the work. Of course, soiled straw will need to be removed at least monthly and replaced with clean straw. Since the poop can easily pile up on the straw, it gets matted down and very heavy to move. In the winter, straw can also collect drips of water and freeze, making it a slushy, slippery mess. Straw is also great to line nest boxes with, as it gives the chickens a nice, soft place to lay their eggs. Keeping the nest boxes clean with straw will also decrease the need to worry about cleaning your eggs. To see how to wash your fresh eggs, read the post here. Dried Leaves – This is my personal favorite. We collect the leaves from our neighbors and place them in the chicken coop. This prevents the toxins from being released into the air when burned as well. win-win. The chickens love to play in the leaves, scratching and checking for any bugs or worms that may have made their home in the piles. Adding at least 12 inches deep of leaves in fall and spring also gives us great compost for the garden. Removing the leaves and cleaning the chicken coop with this method takes about 20 minutes. Leaves collect the poop and are easy to shovel up. Another bonus is that leaves will cost you nothing. 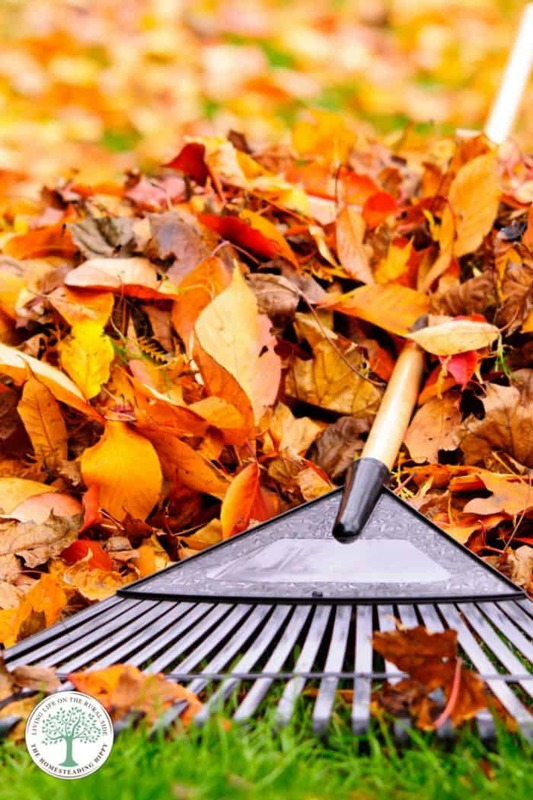 Just offer your free leaf removal services to your neighbors and enjoy their generosity! 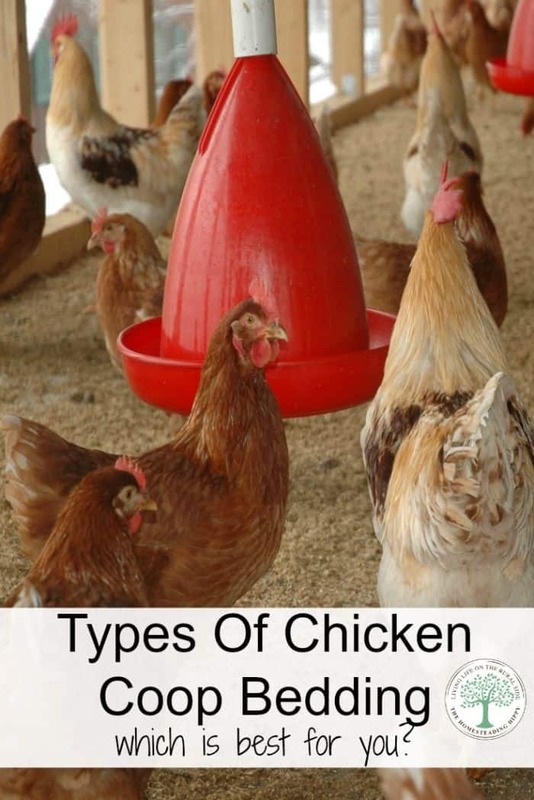 To see how to make your own dust bath area for your chickens, read the post here. Pine shavings and cedar shavings for chickens and their coop. – This is the most expensive way to bed a coop in my opinion. Unless you have a huge wood pile and your own chipper. Wood shavings ARE easy to clean up and have a nice, sweet smell when you first lay them down. Rustic(y) and all, ya know? They are not slippery and slushy in the winter or during a heavy rain, but a con is that they create the most dust out of all the methods we use. We only use wood chips for our chicks in the spring, as it is easy to clean up from a small brooder. 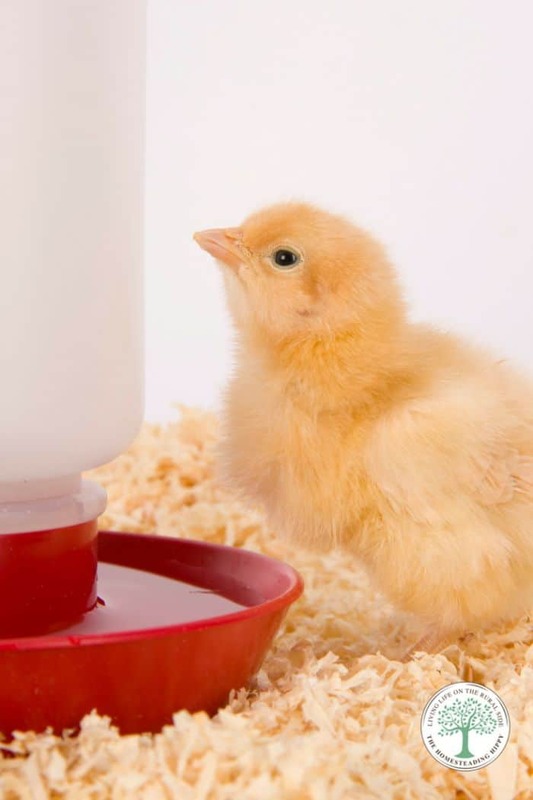 Wood shavings also work great for chicks, as it gives them a comfortable floor to walk on and exercise their legs with. Grass clippings– This is a super cheap way to get bedding for your coop on a regular basis. Every time you mow your lawn, simply toss the grass clippings into the bottom of the coop. The drawback of this method is that you need to replace it every couple of days, and scooping out the manure can be a time consuming task. What methods of chicken coop bedding do you use? Which is your favorite? Be sure to pin this for later! Welcome Jan! I am so glad you are here! I think I am more partial to the deep litter method myself, especially after this year!